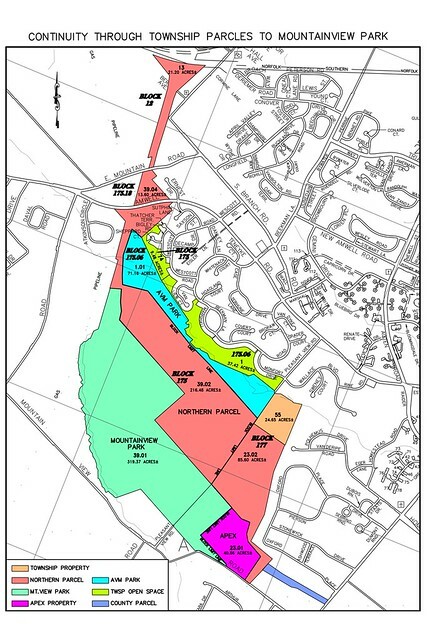 Earlier this year, Hillsborough Township, in conjunction with the Somerset County Improvement Authority, closed on 335 acres of the property contiguous to both Mountain View Park and Ann Van Middlesworth Park, for a total of 724 acres encompassing all of these properties. The newly purchased property is next to the County’s 5,500-acre Sourland Mountain Preserve and is in close proximity to some of the Township’s Open Space areas. The property is flat and relatively open, providing a spectacular view of the Sourland Mountains. “Hillsborough Township is known for its award-winning parks and trails. This additional acreage magnifies that commitment to our community. Our long-term vision had been to connect these three strategic parcels,” stated Gloria McCauley in her remarks at Tuesday’s Township Committee meeting. Mayor McCauley further stated that the acquisition of this parcel will result in the avoidance of more than 2,000 residential homes in the Township and reducing the Township’s Affordable Housing obligation by more than 400 units. Land preservation is always a top priority of the administration of Hillsborough Township Committee and its officials. By the Township continuing to purchase such parcels, it continues to mitigate residential development and further preserves the quality of life for Township residents and citizens. The Sourland Mountain Preserve is county-owned and administered by the Somerset County Park Commission. The Preserve provides passive recreational opportunities in an undisturbed natural setting. The Sourland Mountain Preserve offers numerous recreational opportunities in an undisturbed natural setting, including but not limited to hiking, mountain biking, bird watching, bouldering, and horseback riding. Officials from Somerset County, the Somerset County Park Commission, and Hillsborough Township officially opened the state-of-the-art athletic complex at Mountain View Park on Saturday, April 22, 2017, with a ribbon-cutting ceremony at 141 Mountain View Road in Hillsborough, the site of the former GSA Belle Mead Depot. The Park includes two (2) adult baseball fields, four (4) youth baseball fields and the special needs Challenger Field. All fields are lighted. Amenities include batting cages, playground, pavilion, a concession/restroom facility, park maintenance facility, and a paved perimeter multi-use trail with associated parking. The facility will allow the potential for the future development of up to six (6) additional baseball/softball fields. The Park includes two (2) softball fields, two (2) basketball courts, bocce court, dog park, heated restrooms, two (2) playgrounds , skate park, picnic area, picnic pavilion, fishing pond, sensory garden, two (2) enclosed beehives and one (1) mile unpaved trails.